If there is one category that has changed dramatically over the last few years, it would be moving heads with white-light only LED light sources. Three years ago, all the major manufacturers offered at least a pancake LED fixture. 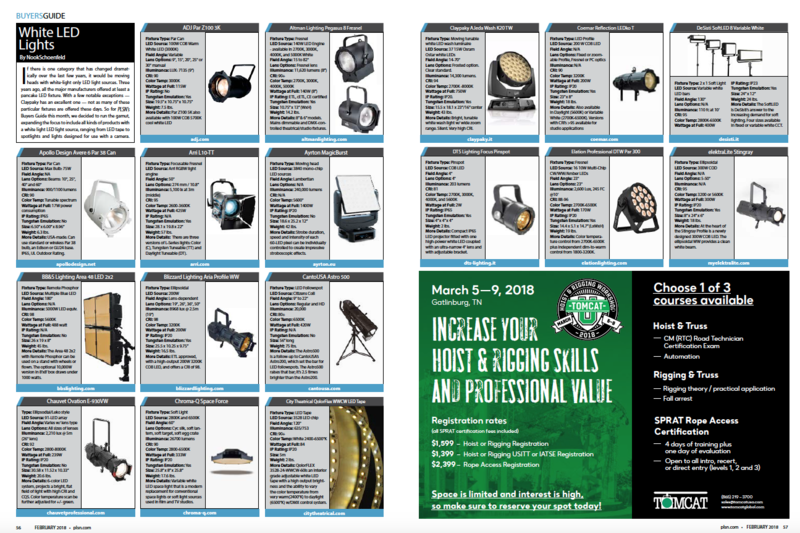 With a few notable exceptions — Claypaky has an excellent one — not as many of these particular fixtures are offered these days. So for PLSN’s Buyers Guide this month, we decided to run the gamut, expanding the focus to include all kinds of products with a white light LED light source, ranging from LED tape to spotlights and lights designed for use with a camera. To download a PDF of the PLSN Feb. 2018 Buyers Guide, CLICK HERE.